A toddler died following a house fire a year to the day after her six-month-old brother died from suspected cot death. The girl called Angel, three, died after a blaze tore through her family home in Carmarthen on Sunday. 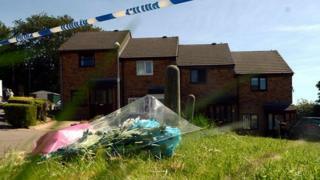 Events surrounding her death are being investigated including why an ambulance was unavailable to take her to hospital. Her mother Alice Smith, 24, remains in hospital after being rescued from the blaze by firefighters. The fire happened on the first anniversary of the little girl's brother Jake's death. Family friend Lisa Naether said: "We were in total shock when we heard, especially as it was the anniversary of her baby brother's death." Another friend Nicola Richards added: "Alice was a great mother who was especially close to Angel Jade - she used to carry Angel everywhere. "How can anyone get over losing both their children?" Neighbours called 999 after spotting black smoke billowing from the family home in Bryn Gorwel at 18:15 BST. Angel and her mother were rescued by firefighters, while the girl's father escaped by jumping from a window. She was taken to the town's Glangwili Hospital by police but was later transferred to the University Hospital of Wales in Cardiff where she died. Carmarthen West and South Pembrokeshire MP Simon Hart said several people spent more than 20 minutes attempting to revive Angel while they waited for an ambulance to arrive. He said he was told an ambulance took 40 minutes to arrive, by which time the toddler had been taken to hospital by police officers. He has written to the Welsh Ambulance Service asking why there was such a long delay and where the ambulances that cover the area were when the incident was reported. An ambulance service spokeswoman said: "We are aware of this tragic incident and are currently looking into the details surrounding it." It took fire crews almost four hours to bring the fire under control. A neighbour said she ran into the street when she heard screaming. She described the scene as "chaos" and said a man jumped out of the window, while a woman was carried out by a firefighter.